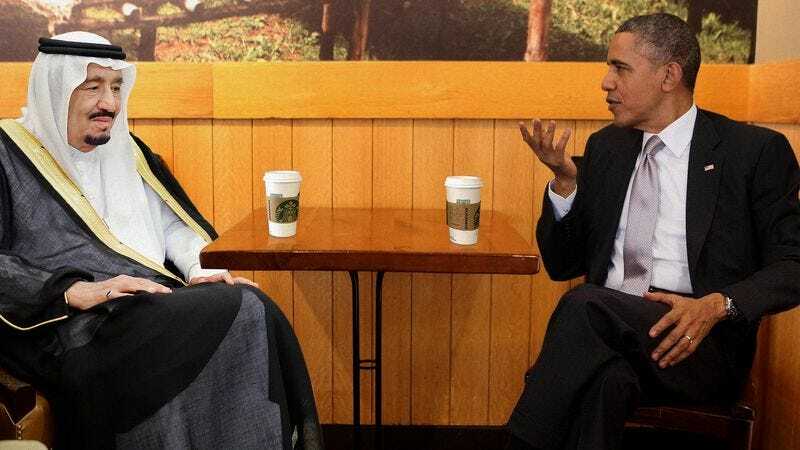 WASHINGTON—After locating several empty seats at a communal table near the service counter, President Barack Obama reportedly held diplomatic talks with a Saudi Arabian delegation Friday at a local Starbucks while the Oval Office carpet was being cleaned. “You go up and order first, and I’ll stay here and make sure we don’t lose our spot,” Obama said to Saudi Arabia’s King Salman as he brushed away several unidentified crumbs from the tabletop and pulled over an additional unused chair from a nearby table for the pair’s translator. “After we get our drinks, we can jump right in on trade figures. And if it gets too loud here, we can go over to the other location on K Street, but let me just warn you that that one’s a bit smaller and the bathroom line tends to snake into the seating area.” At press time, sources confirmed that negotiations were derailed by a customer at the next table talking loudly on his phone.